$225.00 Per Player Based On A 32-Player Minimum. * Please inquire if there are any player discounts currently available. To Meet Minimums (If Needed): Open To Outside Players & Open To Middle School Players. During your Volleyball1on1 Summer Camp week using the manual, we cover: helping high school coaches build their culture & program, the ongoing management, “What Great Looks Like!” ®, “Superior Coaching Systems” ™, “It’s Bigger Than Volleyball System” ™, and much more. Volleyball1on1 Practice Plan Outline is a large 24″ by 36″ inch poster that you place on your practice board or a wall in your gym to streamline practice. 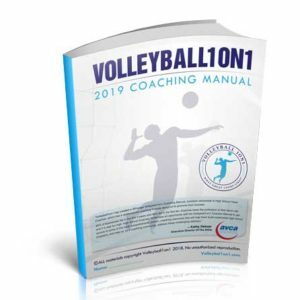 The poster is laminated and works in conjunction with Volleyball1on1 Practice Formula and the 31 practice plans in the Volleyball1on1 Coaching manual. 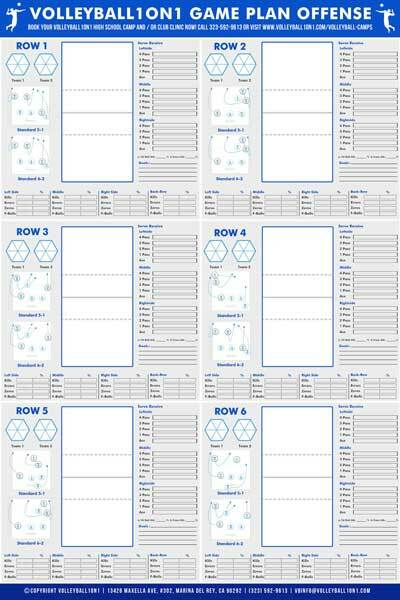 This poster makes planning and running a practice easier. Beyond volleyball this poster will also help you teach players important life lessons through sports and help you improve dynamics. Volleyball1on1 Game Plan Offense Poster is a large 24″ by 36″ inch poster that you place on your practice board or a wall in your offense, specifically how you work on rotations. As all coaches know you tend to have 3 good, 2 bad and 1 OK rotation with all teams. Our job as coaches is to work out the appropriate balance and improve the areas we are weakest while maintaining the areas we are strongest. This posters offers a number of ways to measure and improve your offense by rotation. 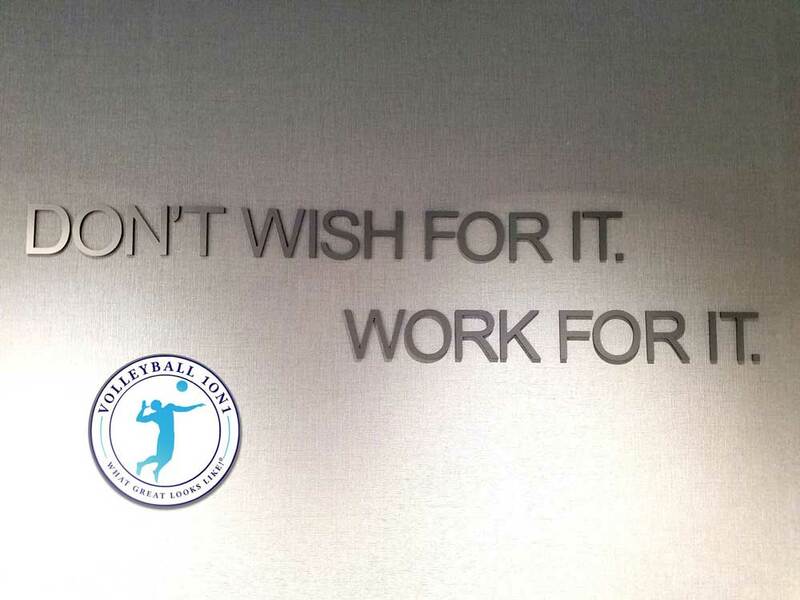 Both posters have never been offered in the sport of volleyball till now and bring many important concepts and strategies used at the collegiate level in an easy to use format for high school volleyball. Three “What Great Looks Like!” ®: Playing Standard, Coaching Standard, and Winning Culture Poster Sets. You will receive three Volleyball1on1 “What Great Look’s Like!” ® Poster Sets (Large Size: 27” x 39” Per Poster). 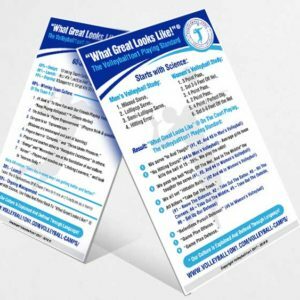 Your “What Great Look’s Like!” ® Poster Sets will help reinforce during your Volleyball1on1 Summer Camp week and ongoing into your season our “What Great Look’s Like! : Playing Standard, Coaching Standard, and Winning Culture. The process of going from “Good” to “Great” as a program is no accident. At Volleyball1on1 we believe many programs have gone from “Good” to “Great” by following a simple 6-step formula for achieving these results. At your Volleyball1on1 Summer Camp week you will learn step-by-step how to turn your program from good into “What Great Looks Like!” ® with our Volleyball1on1 repeatable superior coaching systems. GREATNESS will apply in the wins and losses. In addition, it will help you develop players / people of character in your program which we define as “Whole Person Growth” and “It’s Bigger Than Volleyball” ™. You too will learn how to develop with our “What Great Look’s Like!” system excellent communicative, goal-setting, self-directed, critical thinking lifelong learners who thrive in competition and under pressure, who know how to work as individuals and / or with a team as a member or a leader while being fair and considering others. Further, you and your staff will learn 7 techniques at your Volleyball1on1 Summer Camp week to make the ball go in “slow motion” and how to provide these techniques successfully to your players. You will receive in your “What Great Looks Like!” poster training sets, three Vision Training Posters to help teach your players to improve their ability to “Read The Game,” “Slow Down The Ball & Game”, and “Deal With Pressure”. 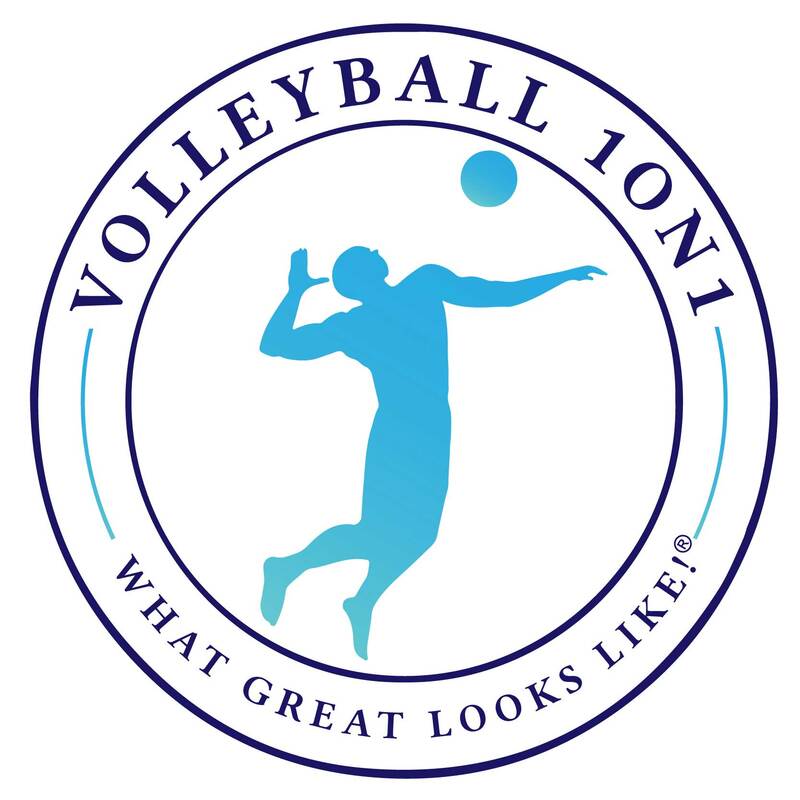 Volleyball1on1.com's Volleyball Video Coaching Library. 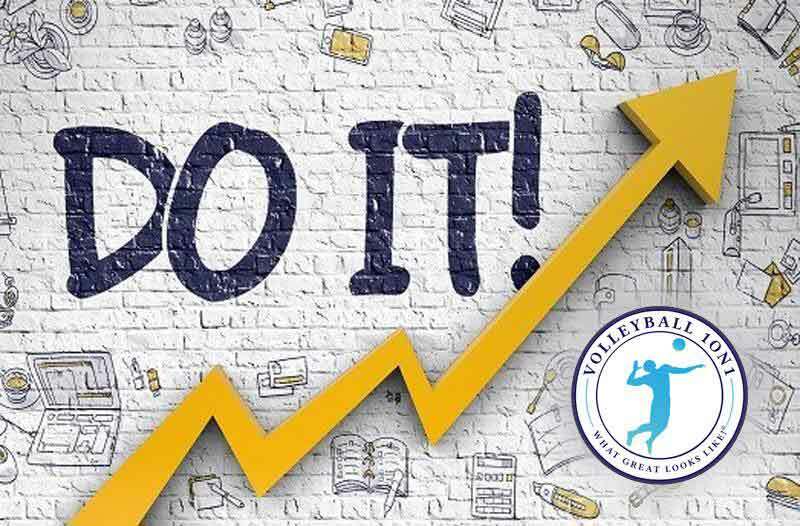 Additionally, all players, coaches, and players parents who attend a Volleyball1on1 Summer Camp will receive a bonus 6-month membership to Volleyball1on1 to support them throughout their high school season. 24 Volleyball1on1 Logo Baseball Hat. Volleyball1on1 Summer Camp players will receive a Volleyball1on1 Logo Baseball Hat. 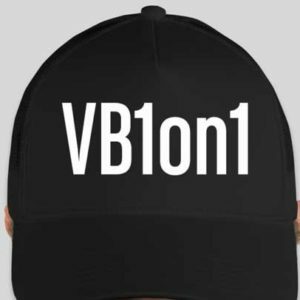 After much feedback Volleyball1on1 has added a new, very popular Logo Baseball Hat for camp attendees. Volleyball1on1 also offers a complimentary set of four Volleyball1on1 Player Empowerment Cards To Each Camp Attendee. The Volleyball1on1 System For Improving Team Dynamics. 1) One-time $125.00 flat fee for all product packing, handling, shipping – Volleyball1on1 Coaching Manuals, “What Great Looks Like!” Poster Sets, and Volleyball1on1 branded beach volleyballs. 2) One-time $145.00 flat transport fee for coaches, which may include: gas, car rental, airfare etc. 3) If your location is more than 200 miles from a major city, you will be responsible for a $250.00 remote destination fee. You are responsible for providing lodging and food for your Volleyball1on1 Coaches via a host family of a player on your team. Alternatively, hotel accommodations. As a rule to set you up for your best Volleyball1on1 Summer Camp week success, it is best your Volleyball1on1 Coaches do not house with you as the Head Coach. Our summer camp curriculum is intensive. Having a rest / break after summer camp hours is important for both you and your Volleyball1on1 coaches.